In this article I am going to explain how to create sub report using rdlc report. In previous article I have explained Report Viewer Configuration Error, How tocreate pie chart in asp.net using chart control and how to implement Sorting,Filter and Pagination with Angular UI-Grid in MVC application. I want to create sub report using RDLC. 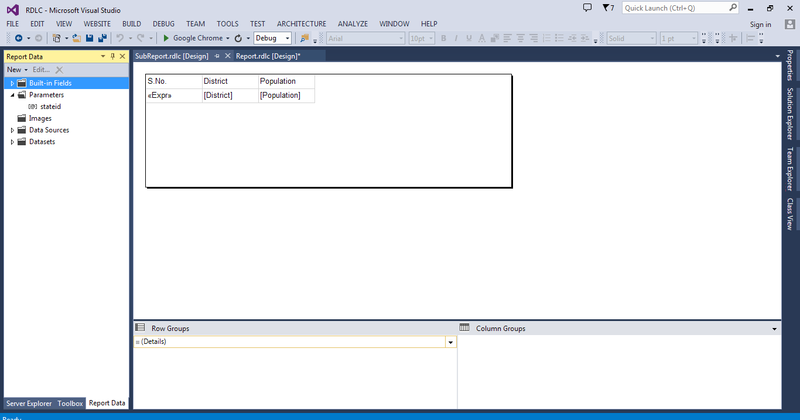 I have created 2 tables [districtpopulation ,StatePopulation] and insert some dummy records. After that create store procedure to fetch data from database. Step 1: Add new website. Step 2: Now add dataset to website. Right click on website >>Add >> Add new item >> dataset. Step 3: after that add connection. 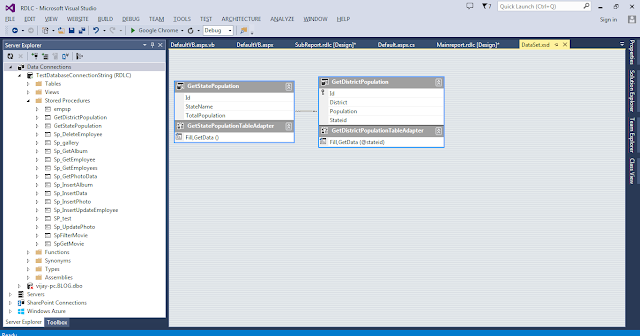 Drag and drop the store procedure to dataset and set foreign key relation. Step 4: Now add report to website. I have added two reports (Main report and sub report). Now add the dataset for main report. Add dataset for sup report and add the parameter. Step 5: Now add the webform to website. Drag and drop the script manager and reportviewer to webform. Set the main report path for local report. Now write the code in code file. Build the website and run.